Designed when wearing fins. Suitable for surfing, swimming, personal watercraft too. 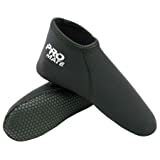 Keeps your feet warm in all watersports activities.